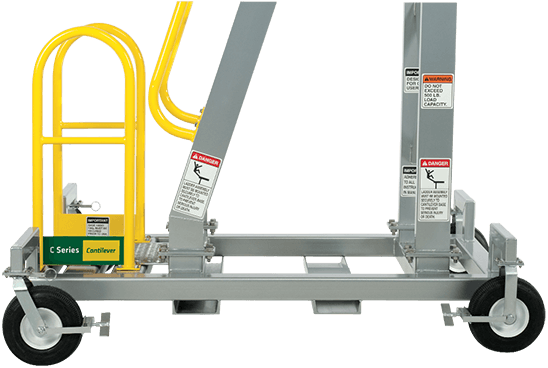 The C Series cantilever work platform gets operators above and on (or over) railcars, tank trucks and other tall industrial machinery. Its steel base provides exceptional counterbalance, while the lightweight aluminum upper body provides single user operability. A large, six square foot work platform provides ample room for an operator as well as parts and tools. 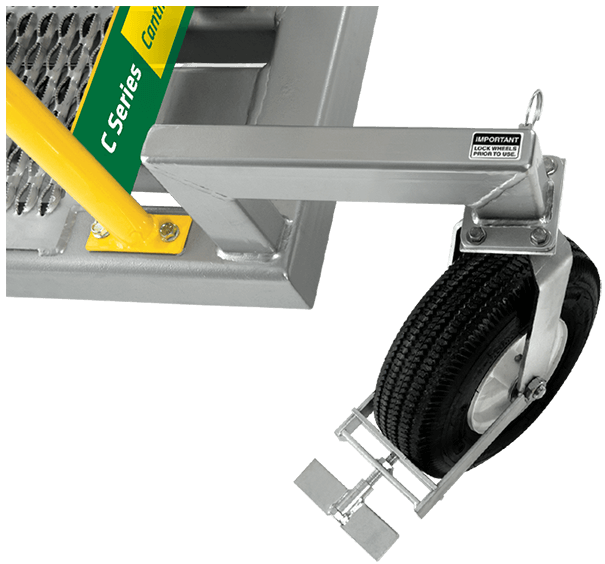 The self-supporting platform extends 2’ 5”(736.6mm) beyond the base of the chassis, providing access while eliminating contact with the equipment being serviced. The full size 2”(50.8mm) diameter handrails are 42”(1,066.8mm) tall around the work platform and powder coated to meet OSHA standards. Our coarse, self-draining tread is featured on both platforms and steps. This pattern provides safe, all-weather access in both rain and snow and reduces ice build up.